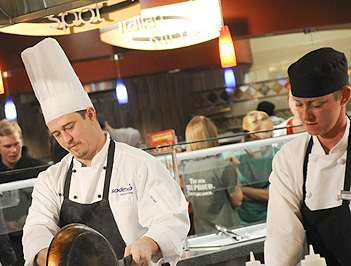 Sodexo, Inc, Centre College’s on-campus food service provider, is a company dedicated to excellent service, corporate citizenship, and fighting hunger. These pillars of their mission all stem from one simple goal – to make every day a better day. Mike Nagorka, General Manager for Sodexo at Centre College, has been with the company for 24 years. Beginning as a student manager in college, he became a project manager for much of North Carolina upon graduation and later was promoted to oversee projects in the southeastern region. After spending 16 months on the road troubleshooting accounts across the country, including the one at Centre, he and his family decided to make the move to Kentucky officially in May 2011. As part of its corporate social responsibility, Sodexo mobilizes employees to join forces and engage with local partners to fight hunger by creating sustainable programs on campuses and in communities. In Danville, the company utilizes initiatives like Feeding Our Future, a summer lunch partnership involving community hunger relief organizations such as Harvest of Hope, to provide free lunches to children in need, and the Backpack Food Program, which discretely offers backpacks filled with nutritious, easy-to-prepare food for students (and their families) who are at risk of hunger when free or reduced-price school lunches are not available. Sodexo, Inc is proud to sponsor the Norton Center’s engagement of “We Are What We Eat.” Learn more at Sodexousa.com. For information on how you can support Norton Center programs and performances, please contact the Norton Center Development Office at 859.238.5421.